I’ve mentioned it plenty of times before – but I am no baker. Give me a fridge full of random ingredients and I can coax out a decent dinner. Give me detailed instructions on how to bake a cake with presmeasured ingredients and I still might fail. This time I didn’t though! I made a gorgeous strawberry shortcake cake. It was a basic cake that I filled with strawberries and fresh whipped cream and then topped with a whipped cream frosting. 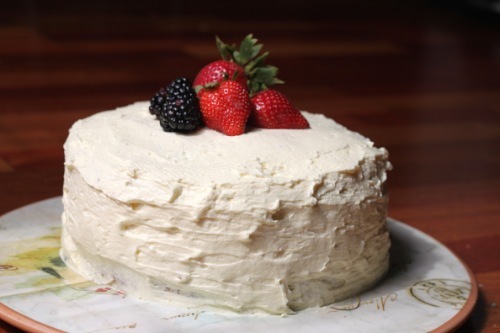 Here is the recipe for the cake portion – from foodnetwork.com exactly. I used my own frosting recipe. Preheat oven to 350 degrees with a rack in the middle of the oven. Lightly coat 2 (9-inch) cake pans with nonstick vegetable spray. Line the bottoms with a circle of baking parchment. Into a large bowl, sift the flour, baking powder and salt together, 3 times. In a small saucepan, bring the milk and butter to a boil. Remove from the heat and add the vanilla and lemon extracts. In separate mixing bowl, beat the eggs and sugar until pale yellow, and fluffy, and doubled in volume. While still beating, drizzle in the hot milk mixture. Fold in the flour mixture. Spread the batter in the prepared pans and bake for 15 minutes, or until golden, the center springs back when lightly pressed, and a cake tester comes out clean. Set the pans on a rack to cool. 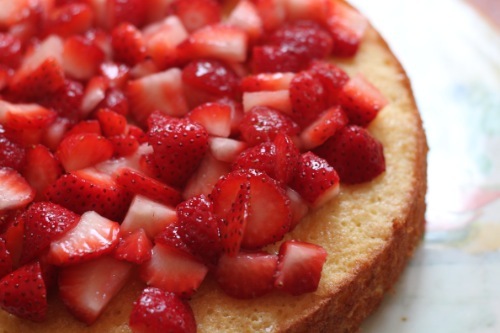 Run the tip of a knife around the edges of the cakes to loosen them, and turn them out of the pans. I make fresh whipped cream fairly often, but I knew I needed something to stabilize it. I was making the cake in the afternoon and the party we hosted wasn’t until evening. I ended up adding a bit of gelatin to the whipped cream and it worked out perfectly. I need to work on my decorating skills as I had a tough time making the cake smooth, but I think the rustic look worked for this style cake. It was my first time not only making a cake from scratch but also doing a “frosting” of sorts. Usually I only pick one or the other because I’m not confident at all. Now I can officially bake delicious chocolate chip cookies, healthy banana muffins for the kids’ breakfasts, a mean pumpkin pie cake, and this cake! I hope to expand that list this summer.